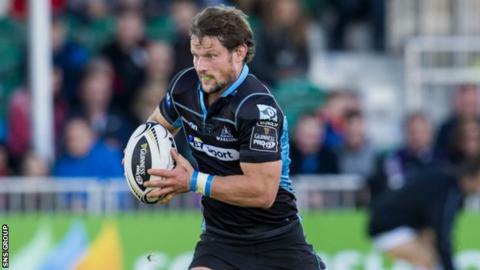 Glasgow Warriors can use the experience of last season's Pro12 success to make an impact in the European Champions Cup, says centre Peter Horne. "After winning the league, we're desperate to make our name on the European stage and try and get the respect we feel we deserve," he said. "We've been close in the last few years but not quite got over the line. "We played in some big games last season, there were some big moments, and that will stand us in good stead." Looking ahead to Saturday's campaign opener away to Racing 92 in Paris, Horne admitted that January's loss to Bath "still hurts". Bidding to reach the quarter-finals for the first time, Warriors needed to win at the Recreation Ground but Sean Maitland was stopped inches from the line in the last minute of a 20-15 loss. Northampton Saints and Pro12 rivals Scarlets make up Pool 3 and Horne is relishing the test. "This is the crown jewel of club rugby and every team is up for it that little bit more," explained the Scotland international. "The games are quicker, more intense. "It's a really exciting group, exactly what you want to be involved in. "It's the best in Europe all going at it, so it will be good fun." Gregor Townsend's side opened this season with 16-10 home defeat to Scarlets, although the hosts were much weakened by the absence of their World Cup stars. Horne scored a last-gasp try in a 27-20 win over Northampton in 2013, while a 15-0 lead was spurned in the return game. Glasgow have never met Racing 92 and have won just three of their last 14 matches against French opponents. "We probably don't have the same budget as some of the bigger teams like Toulon and co but on our day I think we can match anyone," continued Horne. "There is no reason for us to fear the more established teams at this level but it's a massive challenge. "We'll be doing everything we can to make sure we qualify for the last eight. After that, it's knockout rugby and anything can happen."